SECOMEXP-945 - SLN Technologies Pvt Ltd. 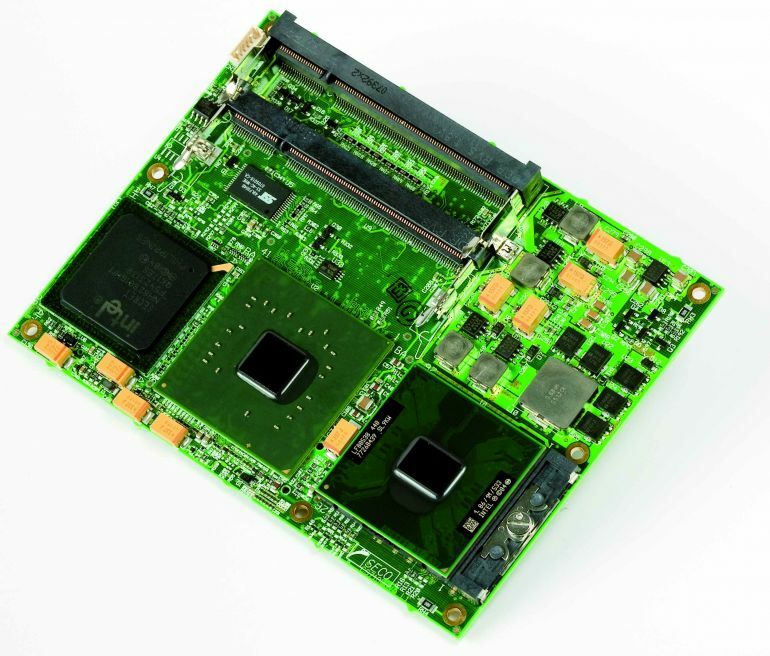 The SECOMEXP-945 is a module in the COM Express type 2 basic standard, based on the 945GME + ICH7-M and supports Intel Core 2 Duo, Core Duo and Celeron M processors. This module offers up to 8 USB 2.0 ports, 2 SATA, 1 IDE, 1 Gigabit Ethernet and up to 6 PCI-Express lane x1 (four of them also configurable as 1 PCIe x4), one of which is configurable as PCI-Express lane x16 (PEG) or as Dual Channel SDVO. The presence of a Dual Channel Memory interface, on 2 SO-DIMM DDR2 SDRAM sockets for up to 4 GB, enables higher performances with same clock frequencies of the CPU. The M600R is an ETX™ baseboard designed to be the startup for any customer that begin to valuate ETX™ board’s charateristics. M600R has two different set of connectors: front panel connectors (PS/2 mouse & keyboard, USB, Ethernet, Parallels and Serials, VGA) and on board connectors (ATX Power, IrDA, PC/104 and PC/104 Plus, PCI slots, Floppy Disk, Hard Disk, LVDS, Video Out). The new SECO panel SPPC 12 is designed specifically for high level industrial applications where reliability, low power, long term availability and competitive price are a must. Based on ETX architecture mount an Intel® Celeron® M processor at 800MHz it integrates in only one product all standard functions of a normal PC including a bright LCD TFT display with optional touch-screen, 4 serials, 1 parallel, 4 USB, Ethernet, Mini PCI socket on board for Wi-Fi cards, IDE Flash Disk (up to 2GB), PS/2 mouse and keyboard ports, VGA connector, Audio In/Out ports, optional 2.5” Hard Disk. The E497R is a PC/104-format digital I/O module available in two configurations: 48 I/O TTL channels and 16 High-Current Outputs and 16 Optoinsulated Inputs. Both configurations contain two 82C55 ICs, each having three 8-bits software configurable I/O ports. Each 82C55 has its own 50-pin I/O header for external connections. The ports direction can be selected by programming control registers built into the 82C55 chip. The I/O headers are organized to allow direct interfacing to OPTO-22 standard. The M429R module is a PC/104 16-bit high performance Ethernet interface. It integrates an Ethernet NE2000 compatible controller with installed both 10BaseT (twisted pair) and 10Base2 (coaxial) interfaces. From Setup it is possible to select address and interrupt line, moreover it is possible to select the transmission media and to autodetect the connection cable. The 10Base2 interface is available through an additional module installed on board. If only 10BaseT interface is selected, the 10Base2 module is disabled in order to reduce the module power consumption. The M429R comes with drivers for a wide variety of networks ands operating systems.